Having watched some of the Swinton game this morning on TV. I am amazed that they were allowed to play at Markham. The facilities looked really poor. Ground looked worse than SHU where Sheffield played. Nothing unusual considering the coach they have! Think it shows their pedigree or lack of it, they don’t like it when things don’t go their way and get petulant, like a bunch of whining kids, and that’s an insult to some of the junior teams. It was good to see Ben taking such positive action with the dissent. Jack Bussey stamping his feet like a spoiled child. "First half we were very good in all aspects and very aggressive, it showed with Warrington they started throwing the toys out of the pram at times. 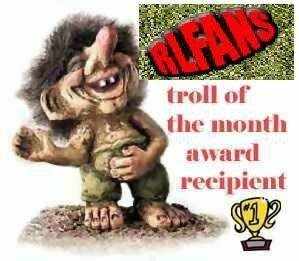 They didn't like it"
Rowley did the same with Leigh which is why they failed in play offs first time round, they tried the bully tactics against SL opposition. They got found out on sun, against other championship side they are not going to struggle as they did against wire to maintain the pace which is why they kept getting caught out. Interesting article on the issues that arose from Sunday game. Ben Thaler can’t ref every game though.